Step back in time to the 1920s as the government is ramping up enforcement of the newly enacted prohibition laws. Naturally, socialites from across the state are flocking to an underground speakeasy in the heart of the city, secretly arranged by the members of Scholar Wine. San Francisco's most glamorous pleasure seekers are invited to join us at Monroe SF for a night of drinking and dancing. 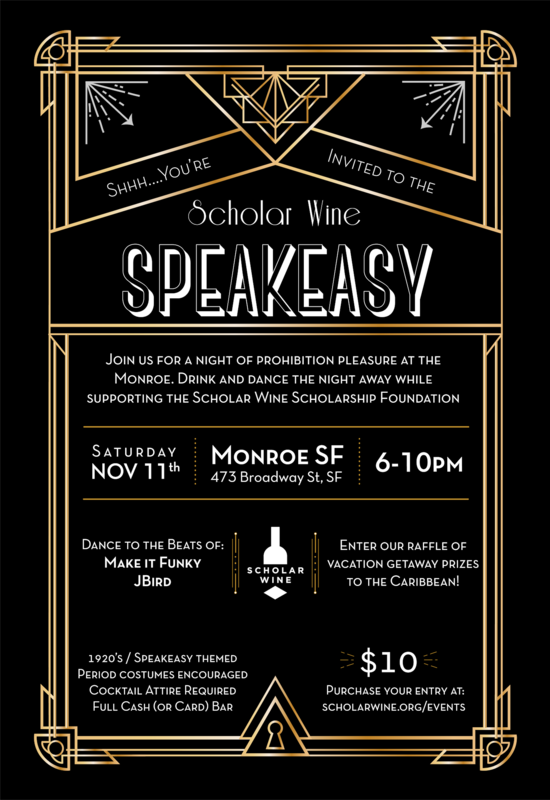 Forget your morals, but bring your heart as all the proceeds benefit the Scholar Wine Scholarship Foundation. With discounted drinks and luxury vacation giveaways this will surely be a night to remember. Shrug your inhibitions aside and join us on November 11th as the underground world comes to life for one night only.